Survation’s latest voting intention poll, conducted online between 7th – 8th March, shows that Labour have extended their lead over the Conservatives to seven points. 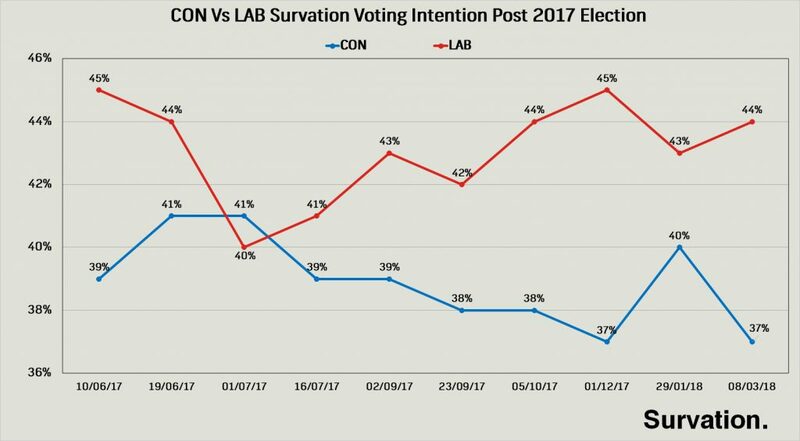 The last seven Survation polls have shown higher support for the Labour Party than the Conservatives, as seen in the graph below. Q3. In 2007/8, there was a financial crisis, known as the ‘Global Financial Crisis’, which began as a crisis in the mortgage market in the USA, but became an international banking crisis due to excessive risk-taking by global investment banks including the banks operating in the UK. Q4. There have been cuts to public spending and services in the UK since 2010. Do you think that the level of public spending cuts has gone…? Q5. On Tuesday 13 March 2018 the Chancellor of the Exchequer will be making the government’s Spring Budget Statement to set out the government’s future spending plans. Q6. Considering public services that have been outsourced to the private sector, which of the following is is closest to your view? Q7. Thinking about your own finances and the 12 months ahead, to what extent do you feel optimistic or pessimistic about your personal finances? Q8. A recession is defined as a period where the size of the economy (GDP) contracts for two consecutive quarters (6 months). Thinking about what you may have seen or heard, how likely do you think it is that the UK economy will experience a recession in the next two years?